Objective To determine whether reported therapeutic interventions for arthrogenic muscle inhibition (AMI) in patients with ACL injuries, following ACL reconstruction, or in laboratory studies of AMI, are effective in improving quadriceps activation failure when compared with standard therapy in control groups. Design A scoping review of the efficacy of interventions was conducted in accordance with the methodological framework of Arksey and O’Malley and the Preferred Reporting Items for Systematic Reviews and Meta-Analyses guidelines. Search terms included ‘arthrogenic muscle inhibition’, ‘quadriceps activation following knee injuries’, ‘anterior cruciate’ or ‘knee’ combined with ‘quadriceps activation’, ‘quadriceps inhibition’, ‘corticomotor’, ‘arthrogenic’, ‘brain activation’ and ‘neuroplasticity’. Articles were evaluated for risk of bias using the PEDro (Physiotherapy Evidence Database) criteria. The overall quality of evidence for each intervention was assessed using Grading of Recommendations Assessment, Development and Evaluation (GRADE). Data sources PubMed, EMBASE and Cumulative Index to Nursing and Allied Health Literature databases. Eligibility criteria for selecting studies Isolated case reports and articles reporting outcomes in patients with chronic disease or major trauma were excluded. All other original research articles were included. Results 780 potential articles were identified. 20 met the inclusion criteria. These studies provided a moderate quality of evidence to support the efficacy of cryotherapy and physical exercises in the management of AMI. There was low-quality evidence for efficacy of neuromuscular electrical stimulation and transcutaneous electrical nerve stimulation, and very low-quality evidence for efficacy of ultrasound and vibration. Conclusions This scoping review demonstrated moderate-quality evidence for the efficacy of cryotherapy and physical exercises in improving quadriceps activation failure after ACL injury and reconstruction. These therapeutic modalities are therefore recommended in the management of AMI. Recently, several clinical studies have suggested specific treatment modalities for AMI.13–34 Most of the therapeutic interventions for AMI aim to alter motor excitability using disinhibitory mechanisms.35 These improve voluntary quadriceps activation by targeting either joint mechanoreceptors, the peripheral nervous system around the joint (mainly group III and IV afferent nerves) or the central nervous system directly.10 35 The aim of this scoping review was to determine the strength of evidence supporting the use of common therapeutic interventions for AMI in patients with ACL injuries, following ACLR, or in laboratory studies of AMI. We conducted a scoping review as this approach is superior to a systematic review in addressing an exploratory research question.36 37 We followed the five-stage methodological framework of Arksey and O’Malley36 and the Preferred Reporting Items for Systematic Reviews and Meta-Analyses 2009 checklist (see figure 1). The study protocol was registered with PROSPERO (International prospective register of systematic reviews) database (trial registration number: CRD42017067499). PRISMA (Preferred Reporting Items for Systematic Reviews and Meta-Analyses) flow diagram. The literature search used subject mapping and keywords and is presented in online supplementary appendix 1. The search strategy was applied to the PubMed, EMBASE and Cumulative Index to Nursing and Allied Health Literature databases by two authors independently on 12 March 2017. The same authors also independently performed all aspects of the study selection. We excluded isolated case reports and articles which included patients with chronic conditions (eg, osteoarthritis) or major trauma (fracture, multiligament injury, neurovascular injury). Any disagreement between reviewers regarding study eligibility were resolved through discussion. Each article was reviewed for relevance, and the references of the included articles were examined to identify further eligible studies. Data extraction and risk of bias assessment were performed independently by two investigators. A template was used for data extraction that included study design, participants, inclusion/exclusion criteria, intervention investigated, comparators, outcome measures (quadriceps activation/strength including central activation ratio (CAR), peak torque, maximal voluntary isometric contraction (MVIC), H-reflex amplitude, knee flexion angle symmetry and muscle fibre conduction velocity), main findings, conclusion and level of evidence. Due to heterogeneity among studies with respect to the populations, interventions and outcomes studied, it was not possible to pool data. Instead, we collated efficacy data with respect to the outcome measures defined in stage 4 and synthesised a narrative summary of the evidence for each intervention. The search strategy yielded 780 articles. The references of these articles were then reviewed and a further six eligible studies were included. Five studies were removed as they were duplicates. After application of eligibility criteria, a total of 20 relevant articles were identified. The date of publication of the included studies ranged from 1990 to 2017. Table 1 summarises the study characteristics, level of evidence of the included studies, outcomes, effect sizes and the GRADE recommendation for each intervention. Table 2 demonstrates how the PEDro scores were calculated for each study. Table 3 demonstrates how the GRADE recommendations for each intervention were determined. 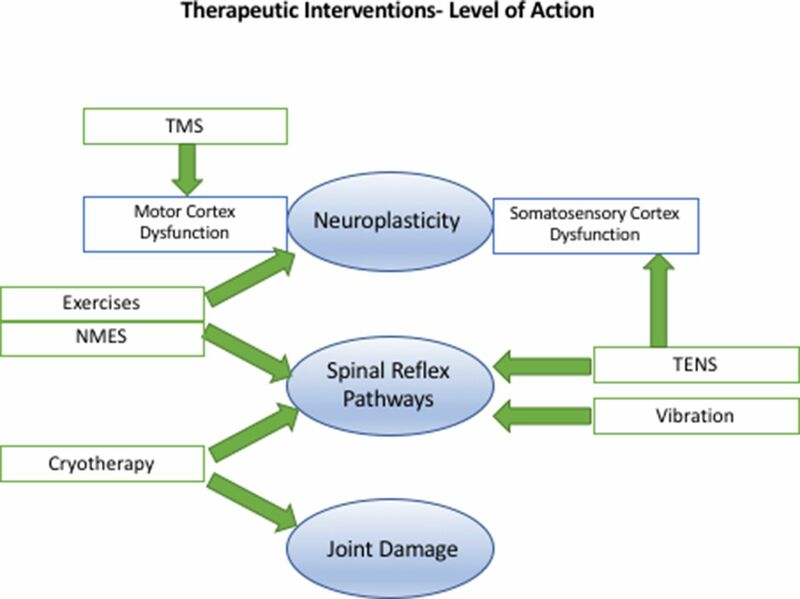 The mechanism and level of action of the therapeutic interventions studied are summarised in figure 2. Therapeutic interventions for arthrogenic muscle inhibition and their level of action. NMES, neuromuscular electrical stimulation; TENS, transcutaneous electrical nerve stimulation; TMS, transcranial magnetic stimulation. Using the GRADE approach, there was moderate-quality evidence for the efficacy of cryotherapy in the treatment of AMI. Three of the exercise programmes consisted of traditional open chain exercises with resistance, and progressive closed chain strengthening exercises of quadriceps and hamstring muscles.15–17 Resistance exercises included quadriceps sets, straight leg raises with hip abduction/adduction and progression to free-standing quarter squats, wall squats, hamstring curls, hip flexion/extension and leg press. Flexibility was attained using hamstring, quadriceps and calf stretching exercises. The fourth study examined the effect of a hamstring fatigue exercise protocol on patients with AMI following ACLR, in a case–control study.26 Hamstring fatigue was induced by participants performing squats to a height of approximately 0.45 m from the ground at the rate of one squat every 2 s. The quadriceps CAR of the ACLR group was significantly higher when evaluated after hamstring fatigue exercises (mean 96.0%, SD 7.6%) versus prefatigue (mean 81.2%, SD 15.8%; p=0.01). GRADE assessment revealed moderate-quality evidence for the efficacy of exercise in the treatment of AMI. GRADE assessment revealed low-quality evidence for the efficacy of NMES in the treatment of AMI. In the only randomised clinical study of transcutaneous electrical nerve stimulation (TENS) in patients with ACL rupture, there was no difference in isometric strength and quadriceps CAR among three groups (exercise only, exercise and TENS device, and 20 min of cryotherapy immediately prior to each daily exercise session).21 While all groups demonstrated a significant improvement in quadriceps strength, and effect sizes suggested potential clinical benefit to patients with AMI, the disinhibitory modalities were no better than exercise alone. Three randomised trials, however, have shown some effect of TENS in improving AMI in the laboratory setting.13 19 20 Two trials showed a significant improvement compared with controls in the quadriceps muscle strength (MVIC),19 20 and the third showed it effectively disinhibited the quadriceps motor neuron pool (measured by H-reflex).13 Although TENS disinhibited the quadriceps motor neuron pool during the treatment, its beneficial effects were lost 30 min after cessation of treatment. In contrast, the beneficial effects of cryotherapy continued up to the final measurement of the H-reflex at 60 min post-treatment. GRADE assessment revealed low-quality evidence for the efficacy of TENS in the treatment of AMI. Pamukoff et al 22 evaluated the role of vibration therapy. The authors randomised ACL reconstructed patients to three groups (whole body vibration (WBV), local muscle vibration (LMV) and control). There was a statistically significant increase in CAR (+4.9%) following WBV and LMV (+2.7%). There was also a reduction in quadriceps active motor threshold following WBV (−3.1%) and LMV (−2.9%), suggesting that the interventions increase corticomotor excitability. In a laboratory study, Blackburn et al 23 also identified that quadriceps CAR improved in WBV (11.4%) and LMV (7.3%) groups, but not in controls. However, we contend that these small changes are of limited clinical significance, particularly given that the mean time since ACLR was over 50 months and the patients did not have proof of AMI. Furthermore, these studies only evaluated the immediate effects of WBV and LMV. GRADE assessment revealed very low-quality evidence for the efficacy of vibration in the treatment of AMI. An RCT evaluated patients with an intra-articular knee injury (22 of 30 were ACL injuries) and quadriceps CAR<90%.24 Non-thermal ultrasound (active) or sham treatment was applied to the knee for a duration of 17 min. The investigators observed increased quadriceps motor neuron pool excitability after ultrasound application compared with the sham group (14%–19% increase in the H-reflex amplitude, p=0.015). GRADE assessment revealed very low-quality evidence for the efficacy of ultrasound in the treatment of AMI. Only one trial was identified: an RCT (n=20) evaluated transcranial magnetic stimulation (TMS) in patients who had a partial meniscectomy and ongoing quadriceps weakness (CAR<85%).28 No significant difference in CAR or MVIC was seen compared with the control group that had no treatment. This systematic review did not identify any evidence supporting the use of TMS in the treatment of AMI. Two RCTs assessed the effects of taping on quadriceps muscle performance.29 30 One assessed patients following ACLR,30 and the other assessed patients with a history of knee pathology and quadriceps CAR<90%.29 Neither study demonstrated a benefit over placebo for any outcome measure. A trial of 14 patients following ACLR randomised patients to receive either a knee brace, neoprene sleeve or no brace.31 No differences were observed between brace and no-brace conditions after aerobic exercise. The available evidence does not support taping or bracing in AMI. The available evidence does not support these treatments in AMI. AMI is responsible for a considerable morbidity after ACLR.1 3 5–8 The main findings of this systematic review are that there is moderate-quality evidence to support the efficacy of cryotherapy and physical exercise therapy (open and closed chain resistance training, with hamstring fatigue exercises) in patients with AMI after ACL injury or reconstruction. In this review, TENS13 19–21 and NMES17 18 27 had a low level quality of evidence to support their efficacy.19 TENS demonstrated large effect sizes in laboratory trials of artificial knee effusions. Although the single clinical trial on ACLR patients demonstrated no advantage over cryotherapy or exercise therapy alone, treatment with TENS demonstrated effect sizes that suggest potential benefits to patients with AMI.21 However, all patients in the TENS group also underwent exercise therapy, and therefore the role of TENS could not be evaluated in isolation. The three clinical trials identified in this study showed small to negligible effect sizes.17 18 27 The clinical results for both NMES and TENS preclude recommendation of these modalities in the management of AMI. In this scoping review ultrasound therapy24 and vibration22 23 demonstrated very low-quality evidence for efficacy. Although two clinical studies (one vibration and one ultrasound) in ACLR patients demonstrated small statistically significant improvements (in CAR and H-reflex, respectively), these were of questionable clinical importance. Currently these modalities cannot be recommended in the management of AMI. Other therapies including TMS,28 taping,29 30 bracing,31 application of heat34 and soft tissue release strategies32 were of no clinical benefit in the management of AMI. We note that some of the included trials were laboratory studies, and these cannot necessarily be extrapolated to the clinical scenario of AMI that occurs after ACL injury. The study methodology has attempted to account for this when awarding the GRADE level of evidence, with a decrease in the score by one level for studies that did not directly assess ACL-injured or reconstructed knees. Another limitation was that the studies were heterogeneous in design and limited by small patient numbers. The quality assessment of the trials using the PEDro scale ranged from 3 to 9 out of a maximum of 10. Lower quality studies were not excluded due to the relatively small number of clinical trials identified. Only English-language articles were included. This scoping review demonstrated moderate-quality evidence for the efficacy of cryotherapy and physical exercises in improving quadriceps activation failure after ACL injury and reconstruction. These therapeutic modalities are therefore recommended in the management of AMI. Lack of knee joint extension and impaired contraction of the quadriceps femoris muscle following ACL reconstruction is known as arthrogenic muscle inhibition (AMI). AMI is associated with gait abnormality, long-term quadriceps atrophy, poor function, dynamic instability, persistent knee pain and early osteoarthritis. Cryotherapy and physical exercises should form the mainstays of management of AMI. Exercise should include traditional quadriceps and hamstring muscles open chain exercises with resistance, progressive closed chain strengthening exercises, as well as hamstring fatiguing exercises. There is low-level evidence to support neuromuscular electrical stimulation and transcutaneous electrical nerve stimulation. There is very low evidence to support ultrasound therapy and vibration. Taping, bracing, application of heat and soft tissue release strategies demonstrated minimal or no benefit in the management of AMI.
. Cryotherapy and transcutaneous electric neuromuscular stimulation decrease arthrogenic muscle inhibition of the vastus medialis after knee joint effusion. J Athl Train 2002;37:25–31.
. Influence of patterned electrical neuromuscular stimulation on quadriceps activation in individuals with knee joint injury. Int J Sports Phys Ther 2014;9:915–23.
. English-language restriction when conducting systematic review-based metaanalyses: Systematic review of published studies. Ottawa: Canadian Agency for Drugs and Technologies in Health, 2009. Oxford Centre for Evidence-based Medicine - Levels of Evidence. 2009. CEBM 2009.
. How to calculate effect sizes from published research articles: a simplified methodology. http://www.bwgriffin.com/gsu/courses/edur9131/content/Effect_Sizes_pdf5.pdf (accessed 28 Aug 2018). Contributors All authors have given final approval of the submitted manuscript and their agreement to be accountable for all aspects of the work in ensuring that questions related to the accuracy or integrity of any part of the work are appropriately investigated and resolved. All authors have made substantial contributions to the design of the work and manuscript writing. Conceptualisation of the work was by MT, BS-C and AS. The acquisition, analysis and interpretation of data were performed by WB, AS and AB. All authors were involved in drafting the work or revising it critically for important intellectual content. Competing interests BS-C, AS and MT are all paid consultants for Arthrex. BS-C also receives royalties and research support from Arthrex.